SmartPractice® launches an online Dental Newsletter builder this March to enhance patient communication, attraction and loyalty, providing a limited time discount on the first mailing. With the help of dental industry experts, each practice has the freedom to craft unique, ROI-driving Newsletters online. With Newsletters, dental offices can leverage eye-catching seasonal designs, a library of images and educational articles crafted by dental industry experts. Combining an exclusive online editing tool with consultant guidance, practices can modify content to meet their unique needs. Offices are also able to personalize their Dental Newsletters with their practice logos and information at no cost. Newsletters are now available with a limited time discount for the first mailing. By launching Dental Newsletters, SmartPractice enables practices to engage both new and existing patients. "With the help of dental industry experts, each practice has the freedom to craft unique, ROI-driving Newsletters online," states the company's Marketing Coordinator, Heather Kalish. Repetition is key when it comes to sending the right messages to patients, and what dental professionals communicate in the office isn’t enough to keep patients loyal long term. Sending quarterly Dental Newsletters lets offices inspire and inform patients in ways that keep practices top-of-mind. Benefits include keeping patients up-to-date on the latest procedures and events at a given office, and also inspiring patients to prioritize their dental health with leading edge news and tips. To attract new patients and retain existing ones, Newsletters include space for special offers such as complimentary services and discounts. SmartPractice Mailing Services ship Dental Newsletters and other office mailings when provided with a list of patients. These services save dental offices time, money and labor when compared with mailing patient communications on their own. Offices can call 800.522.0800 ext. 7568 for a Mailing Services Consultation at no charge. 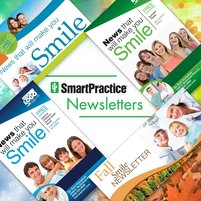 To learn more about Dental Newsletters, visit smartpractice.com/newsletters or call 800.522.0800.